We have received many calls about the latest swine flu scare. Our clients have had several questions. I will try to answer them below. Before you read my answers, however, I suggest you read what Wesley Pruden, editor emeritus of The Washington Times, had to say about the latest swine flu “pandemic”: http://www.washingtontimes.com/news/2009/apr/28/a-pandemic-of-panic-are-we-dead-yet/. I will refer back to it in some of the answers below. Q: Should I be worried about this? A: Worry and panic during an epidemic have never benefited anyone but the stock holders of the pharmaceutical industry, and, of course, the banks that own them. Consider the following: “LOS ANGELES, April 24 (Reuters) – The swine flu outbreak is likely to benefit one of the most prolific and successful venture capital firms in the United States: Kleiner Perkins Caufield & Byers,” Thomson Reuters Private Equity Week reported on Friday, 4/24/09. Q: Do you think this epidemic is real? A. Pruden’s article already answered this question in the negative. There is so far no evidence of an epidemic. Q: Do you believe we are in any danger? The probability of dying from it in the US so far is zero. Q: Should this turn into a real epidemic, what is the best way to protect oneself? 4. Avoid anti-viral drugs (cause suppression of and damage to the immune system). Q: Is there anything homeopathy can to do prevent the swine flu? A. Homeopathic immunization uses two main methods – the nosode (a remedy made from the microbe itself) and the genus epidemicus (a remedy that matches the symptoms of an epidemic). No nosode has yet been made from this virus, and no genus epidemicus been established. However, the US Navy (that just happened to be in Mexico) found that the new virus contains DNA of Influenza Type A and Type B, Asian Influenza, Swine Flu, and Avian flu. We have a recent nosode for Influenza Mix, which is the closest match and likely to be effective. The standard protocol for administration is 3 doses daily for three days. For more information about homeopathic immunization, please feel free to order Homeopathic Immunization and Prevention of Infectious Diseases by Manfred Mueller, MA, DHM, RSHom(NA), CCH now available as an eBook for $29.99. Q: Is there anything else one can do to protect oneself? A. Making and drinking a pitcher of freshly juiced vegetable and/or fruit juice every day gives you the antioxidants you need to help boost your immune system. Taking large doses of Vitamin C (up to 10,000mg daily, as your body tolerates) can boost the immune system. Rosemarin supplements, Echinacea angustifolia tincture (5 drops in water, 3 times daily during infection, or 1 time daily for up to 2 weeks to help boost immune system then take 1-2 week break), Astragalus and certain other medicinal herbs, and Oscillococcinum (standard protocol for administration is 3 doses daily for three days) are likely to confer some protection as well. Q: If I get sick what should I take? A. Homeopathic treatment is likely to be an effective treatment for any new flu-like illness. 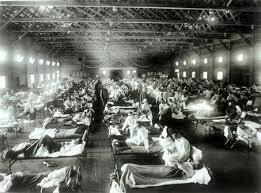 Homeopathic hospitals had a less than 1% mortality rate during the last major real pandemic -1918 Spanish Flu epidemic, while conventional hospitals had between 30 and 60% mortality rates. For additional statistics on homeopathic treatment and the 1918 epidemic visit: http://www.naturalnews.com/026148.html . As always, homeopathic treatment must be individualized. If you develop symptoms contact your homeopath for a consultation. Manfred Mueller, MA, DHM, RSHom(NA), CCH, is a homeopath in full-time private practice since 1986. His phone practice can be reached at 001-619-741-5795 or via email at office@homeopathicassociates.com. Visit his college at www.thehomeopathiccollege.org or his practice website www.homeopathicassociates.com for more information. The information contained in this mailing is intended for educational purposes only and should not be used to treat, prescribe or diagnose any disease, ailment or infirmity. If symptoms develop, please contact your physician or emergency medical help. This message is for the designated recipient only and may contain privileged, proprietary or otherwise private information. If you have received it in error, please notify Homeopathic Associates or The Homeopathic College immediately and delete the original. Any further use of this email is prohibited. subject to fines, imprisonment or civil damages, or both.